Latest post Tue, Jul 31 2018 2:55 PM by Fish. 7 replies. I create and rely on custom column input in almost every selection process. Sometimes multiple columns of info. And MC bins are amazing for this. Yet, there’s always something that completely perplexes me. Why does the quick right-menu that shows previous entries display in the order I added the entry? I can’t think of a reason why the order of the column should be determined by the order the categories were entered. No sense. The human brain just doesn’t work that way. Well, mine doesn’t anyway. If I replace an entry (spelling error, or whatever) it keeps both entries until I close the project and reopen. Only then does it get rid of unused entries. But it gets more perplexing. If I want to sort that order I have to close the project entirely and reopen it. Not the bin. The whole project. It still sorts it in the order it was entered but now in reverse. 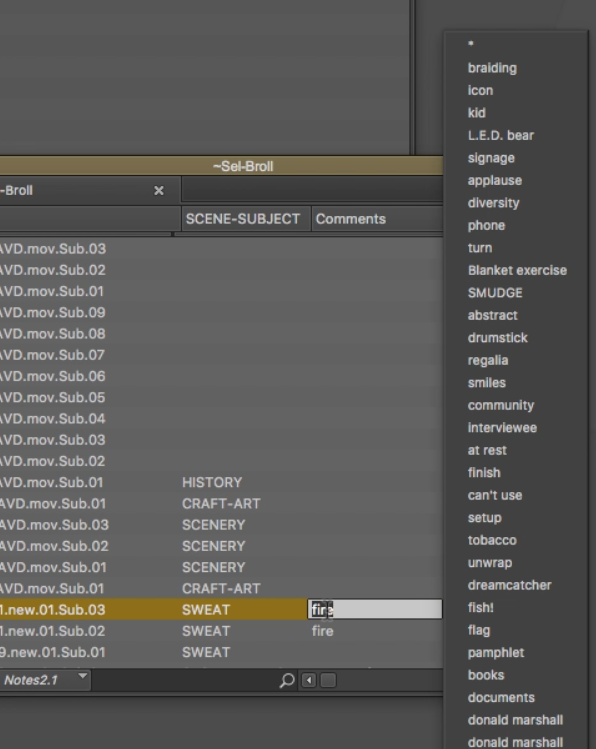 If I want to sort that menu alphabetically I have to sort the column (command-E) and close the project and re-open. But…now they are sorted in reverse-alphabetical (!). to sort it alphabetically I have to reverse sort the column, close the project and re-open. Voila! A) a simple way to refresh the registry. None of this involving closing and opening the bin or the project. When I tried looking this up on Google I got dozens of examples on how to do this in Excel..
Or maybe there is a way to do it! Maybe it’s just eluded me all these years. Weird... CTRL-e should sort the column with no need to quit the software, CTRL-e again reverses the order. Which MC version are You on? On recent versions double click on the column header will sort it, double click again to reverse order. I'd try this with fresh new user settings. You're not getting it. It's not the column's order that isn't sorting. it's the quick menu you can shoose from to choose a previous entry. My apologies still I'd try with a brand new user. To fix quircks like these search the forums for "usual suspects"! So...are you saying you quick menu's DO sort alphabetically? Because this particular quirk has followed me through numerous new USER settings (including a fresh start 2 weeks ago) and many, many interations of MC. I just chalked it up to the code itself. Actually..I apologize. My whole feature request was not posted properly. I have since edited/updated the entire post now so it's more clear. So...are you saying you quick menu's DO sort alphabetically? Is there some console settings that I'm missing?